Gorey Celtic is a Wexford football club was founded in 1991. September of 1991 was Gorey Celtics debut season, plying their trade in Division 1 of the Wicklow League. 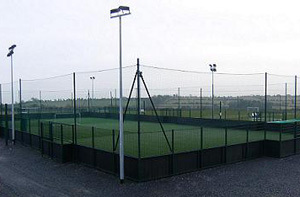 Originally the club's football pitch was in right in the heart of Gorey at Esmonde Street however in 2006 the club relocated to a state of the art facility at Mullaunfin, Creagh. Gorey. The new site allowed the club to grow further and boasts 2 full size pitches, floodlit astro turf pitch, a large clubhouse and a large car park to cater for our growing popularity. This move should certainly pay dividends and the Gorey Celtic players can now be proud to be playing at the best home grounds in the South East. Gorey Celtic teams compete in the Wexford and District League. The club also has Under 10's, Under 12's and Unders 14's girls teams.